The funds are a little tight this week so there wasn't much money for groceries. Luckily we had some things on hand that I was able to use to make some snacks and bread. So far I made some Pudding, Pudding Pops, Jello, No Bake Oatmeal Cookies and tomorrow I am attempting to make Zucchini Bread. Today Gwyn helped me make the No Bake Chocolate Oatmeal Cookies. I used this recipe but added a little bit of honey to it as well. Gwyn did a great job of measuring the ingredients and mixing them all together. And we learned a valuable lesson about NOT putting things on top of the stove. I turned on the wrong burner and we melted a plastic plate. It smoked and melted but didn't catch on fire thank goodness. It was super smelly though and we had to open a window. 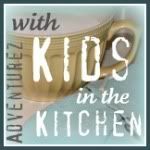 What kind of things have you made with your kids in the kitchen? 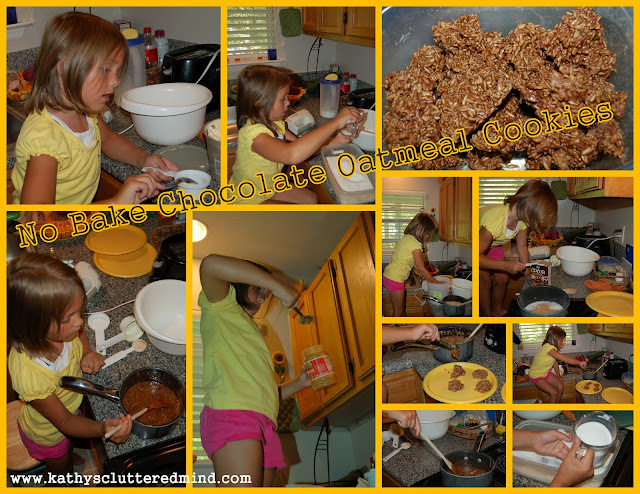 Have you ever had No Bake Oatmeal Cookies? They are super yummy to eat and very cheap, quick and easy to make. My sister used to make these when we were little! I had forgotten about them. I think I'll introduce my girls to these yummy cookies this weekend! I love that they are so easy to make and that they are really hard to screw up perfect for kids.